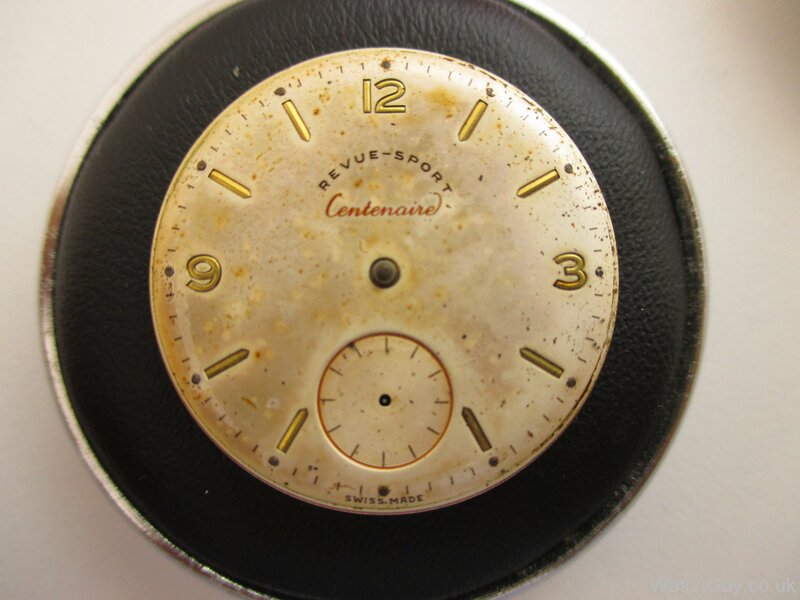 The dial before treatment. 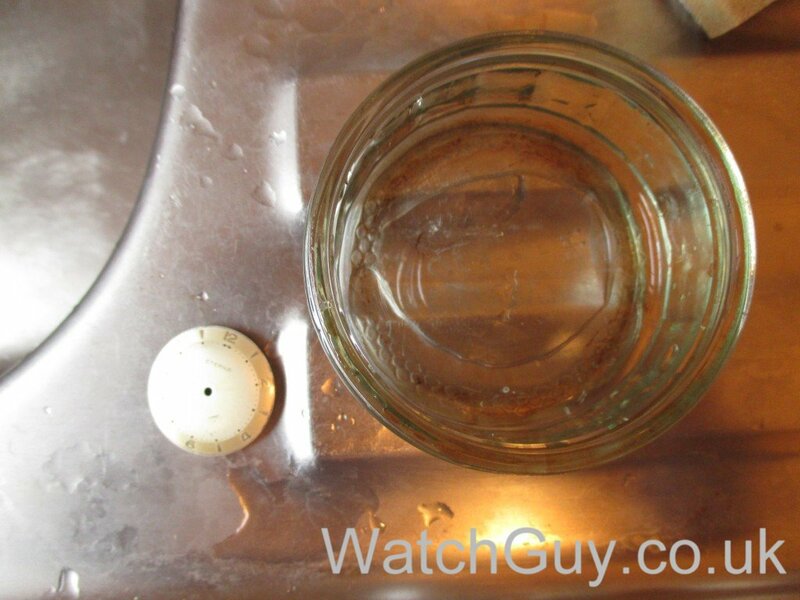 I heat up water to boiling point I then soak the dial. The varnish is partly dissolved after soaking. I now use a soft sponge to wipe of the remaining varnish. It is very important to be careful over the lettering. I blow-dry the dial and inspect it. The dial still has some old varnish around the markers that I clean off with wet pegwood. I use quick drying water based varnish that I dilute to the consistency of milk. 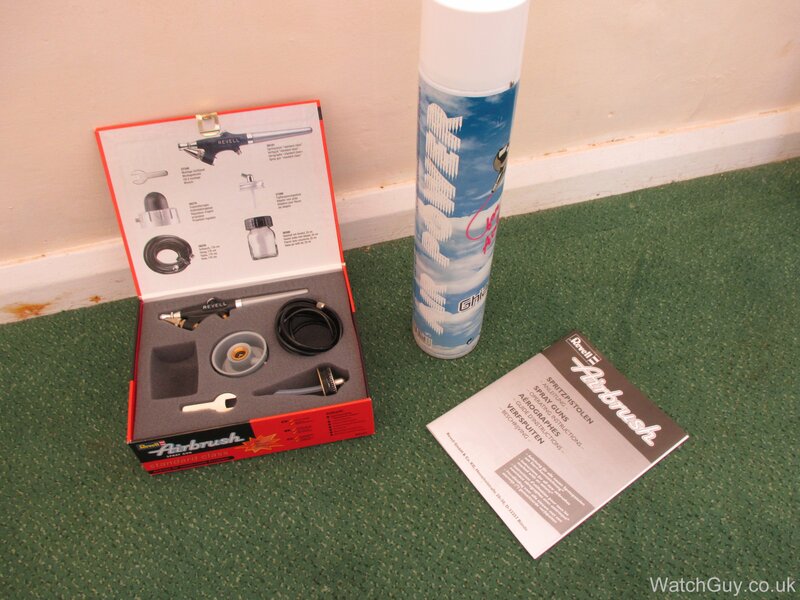 Airbrush kit for models is perfect for this job Everything ready for spraying. I now have a dial ready for varnishing and I spray the dial with as little varnish as possible so not to make it run. Too little varnish gives a bad, uneven result. And the finished result with new luminous compound applied. This looks too good to be true! Problems that can occur are loss of print. 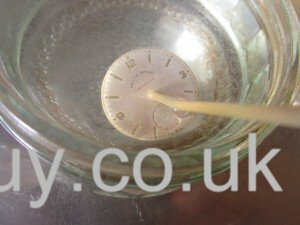 Below are some before and after pictures Dial looks very dirty with lots of dust that has melted in to the varnish somehow. The C and V are lost and so are parts of swiss made, but no markers are damaged. The dial besides the letters looks great with some patina of the good kind still showing. Before brown varnish that really is beyond your usual patina. Some of the lettering is damaged from a mistake of cleaning off dust with rodiko – something I won’t do again! Besides that the watch looks much better than before. The dial looks terrible with brown rust pitting all over from water damage The letters where printed on the varnish and unfortunately fell off with no effort during cleaning. The pitting did not go away in water but after being soaked in vinegar was cleaned off. All is not lost since the dial can still be sent to be restored with a dial specialist. Not a nice finish at all where the watch looks dirty and cracked. No damage to print and looking very fresh and nice. 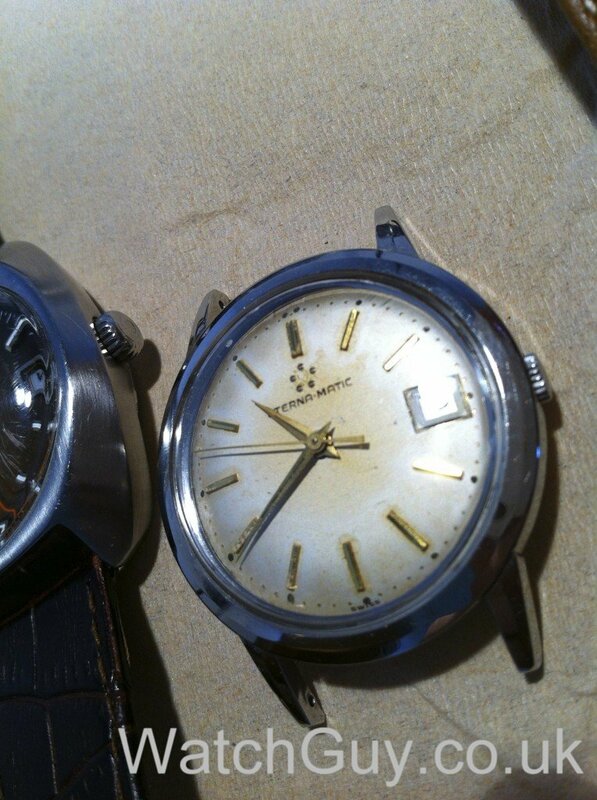 Very dirty looking dial that otherwise would be restored. No damage to print and a nice feel of age. This entry was posted in HowTo, Wrist Watches by Mitka. Bookmark the permalink. Could it also be that may compressor is not strong enough? It delivers a maximum of 2.4 bar (34.8 Psi). I am a Dutch hobbyist and I read your post with very much interest. Impressive what you have accomplished. 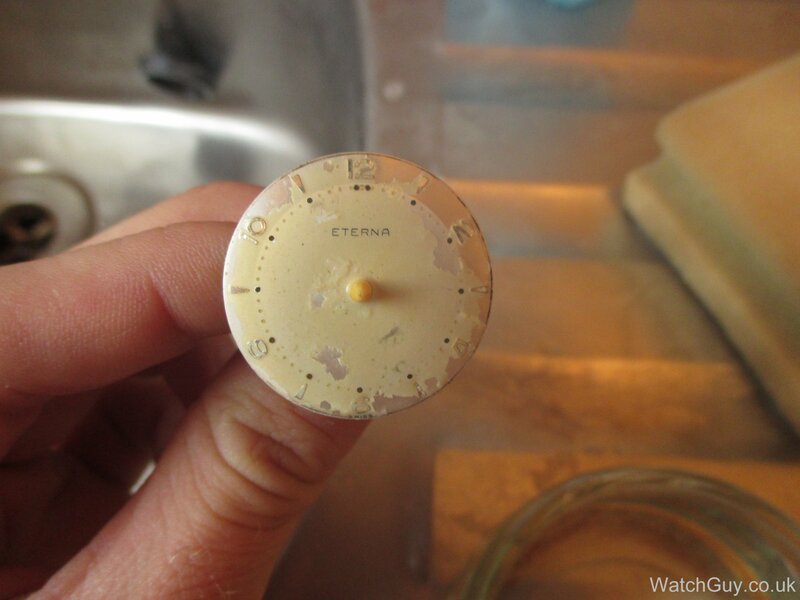 I successfully cleaned a dial of an old watch. I m now experimenting with the proces of putting on a new layer of varnish. 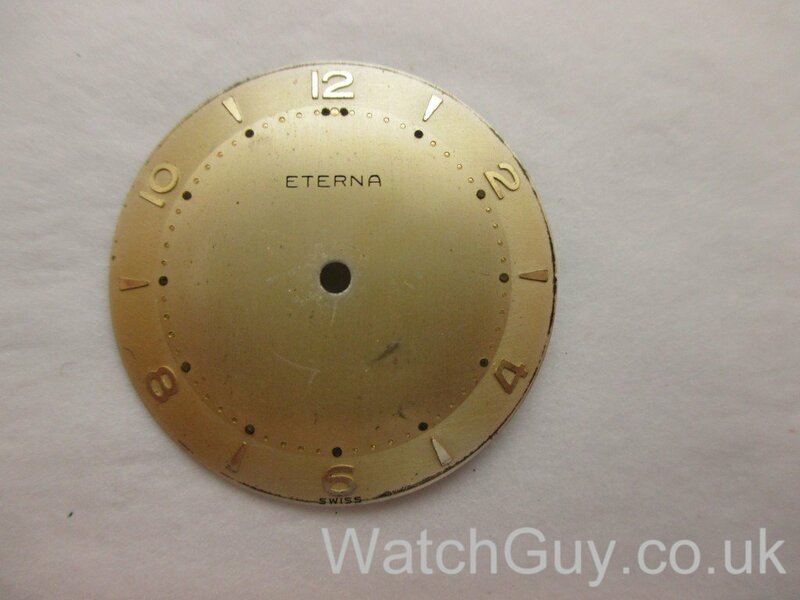 I have been working on an old invaluable dial. So I can experiment freely. Ik keep getting very tiny droplets, that can not bee seen with the bare eye, but will so when using a lupe. 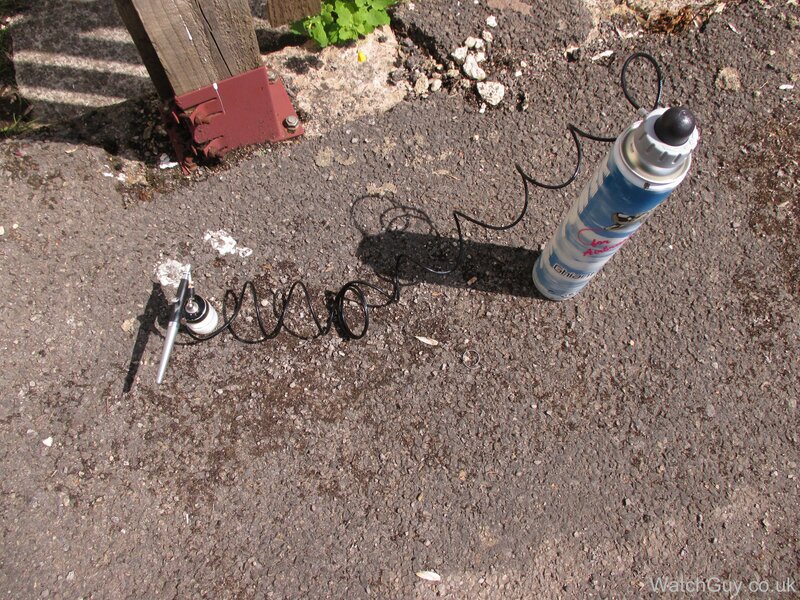 Up until now I do not succeed in spraying such a fine layer of varnish myself. I was wandering wat you use to delete te varnish and wat kind of noble you have on your airbrush. It’s probably the viscosity of your varnish. You have to dilute it quite a bit to get a smooth surface. You are a true magicians!? Old thread, I know but interesting topics regarding watches, paintings and watches. Wow!!! Great site!! Have a few to try myself!! 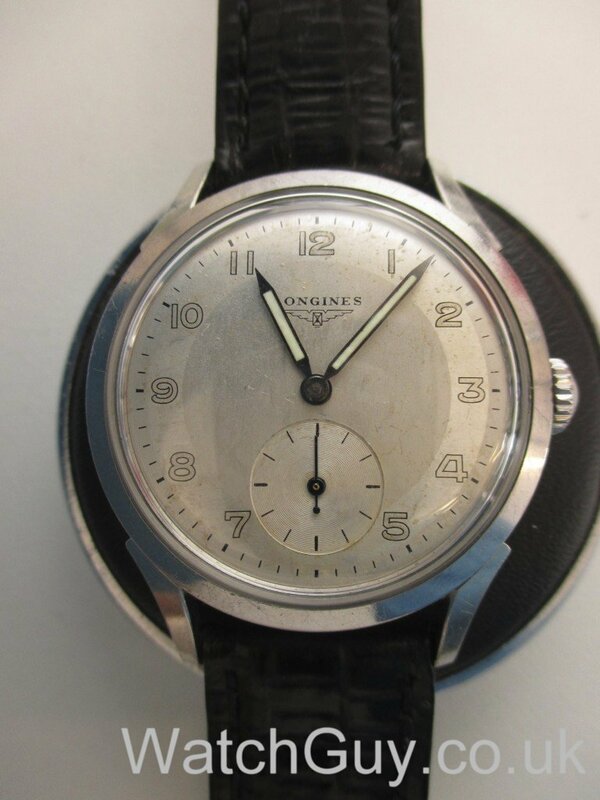 What liquid di you submerge the longines dial to remove the old lume?? Did it come off easy or did you have to scrape hard while in the liquid to preserve the digit outline? Water with a tiny bit of vinegar. You have to go very slowly and be careful. Great work and very inspirational!!! If you are aware of this, I would like to know what precautions you took as I have a 38mm longines with a cracked crystal and a radium dial locked in the back shed away from my yoiung children. 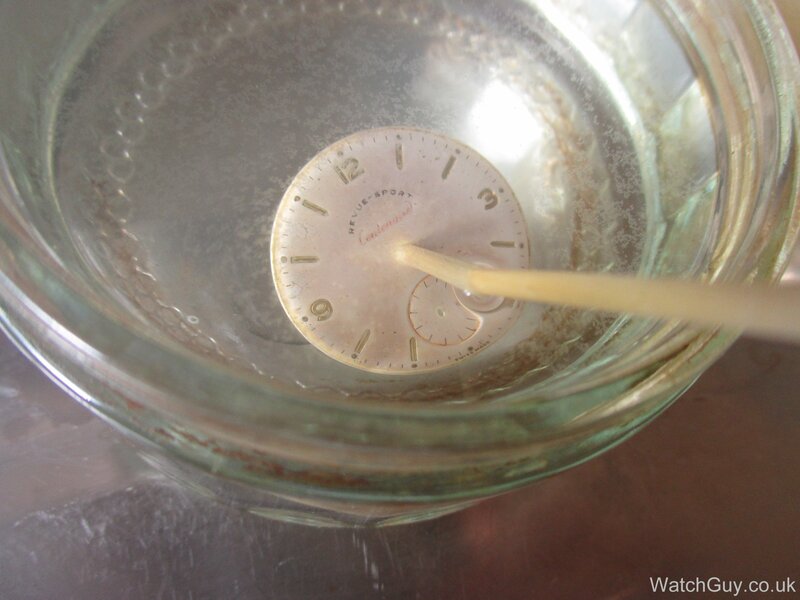 We take the stuff off with the dial submerged in liquid. Keeping it in the shed is a bit over the top. It will ruin the watch. How did you avoid the exposure of the dust inside the movement and from the case prior to removing the dial? Invisible radium dust that can be easily inhaled is the real danger, especially when airborne. 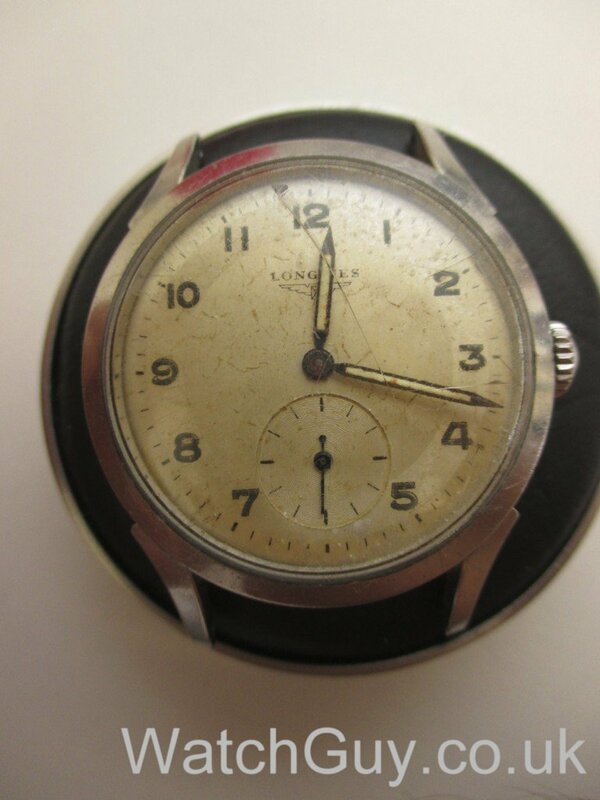 Did you submerge the whole watch in liquid beforehand?In general a sealed watch with radium dial is not as dangerous as exposure to the dust even in microscopic amounts. Just curious!?! I have a vintage woman’s Girard Perregaux watch I purchased at a jeweler’s estate sale a few years ago. 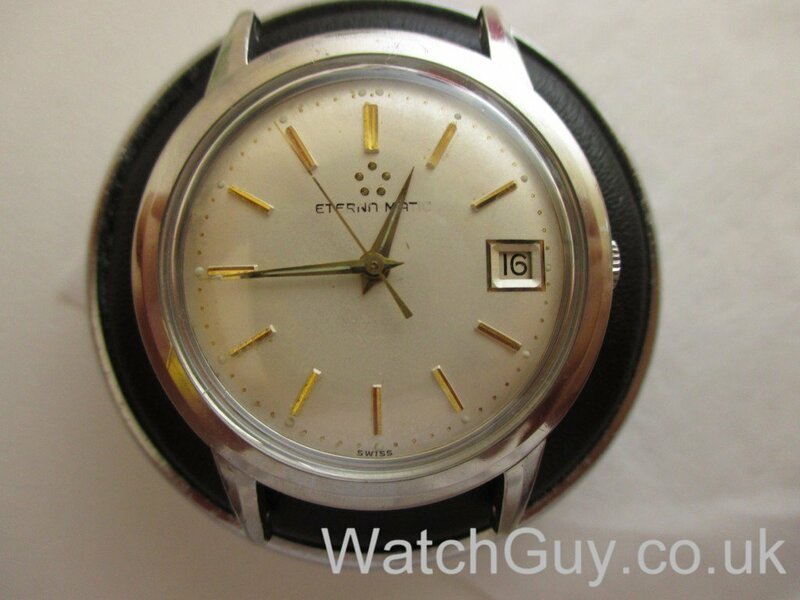 The watch is from the 1960’s. The stem fell out, so I took it to another “reputable” jeweler in another state where I now reside. He sent it out to be repaired, and now the name of the manufacturer, Girard Perregaux is missing completely. 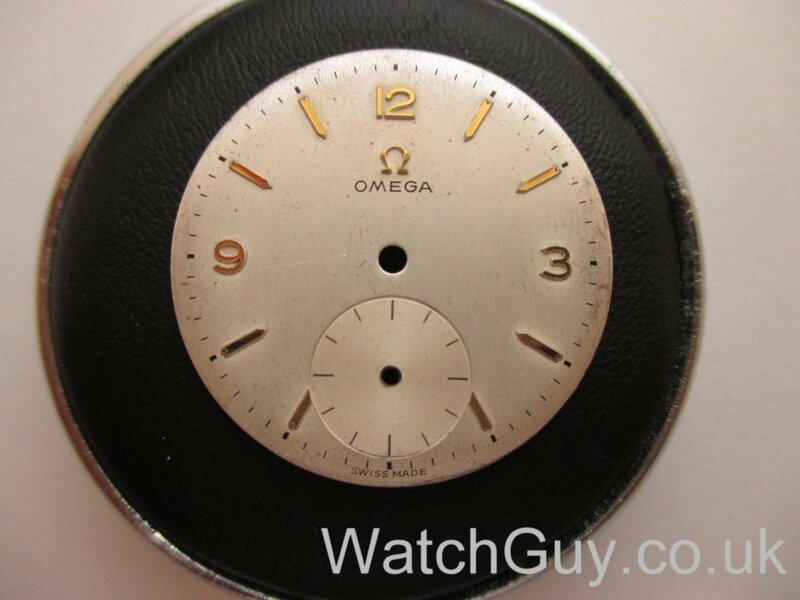 It was printed under the number 12 on the dial, and is no longer there. Can the print be replaced somehow? Thanks. Fascinating dial clean technic! I have a 70’s Gubelin I went directly to dial restoration and now regret I didn’t attempt a cleaning first. 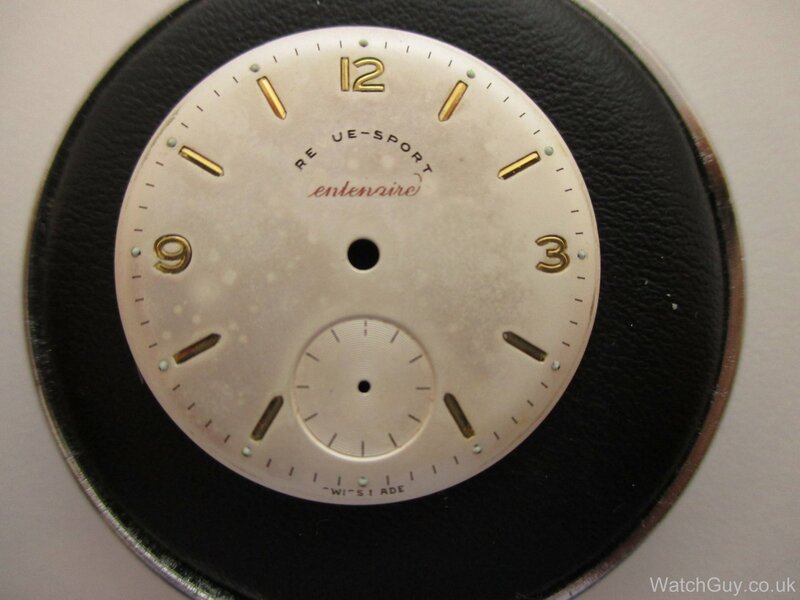 I have a ’54 Hamilton Wilson with a very yellowed dial (kind of hard to see the gold hands against the yellowed dial). 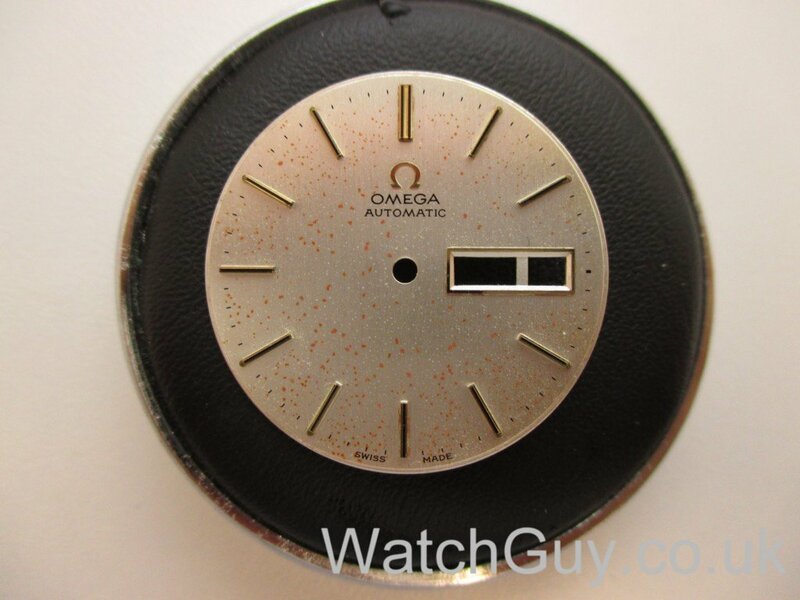 Question: Do you know if the Hamilton print is over the varnish, like your 3rd sample Omega? Nice information. What about just cleaning finger prints and dust particles from a dial? If a finger print is fresh it can be removed with Rodico. Dust you can blow away with compressed air. Hi, I’m going to give this a go with a couple of watches I have, but could you tell me if you use matt or gloss varnish? Hi, We use gloss varnish. We now apply it very thin with a very fine sponge. Good luck. Anyone know if there is a way to get a minor dent or ding off a Dial ? 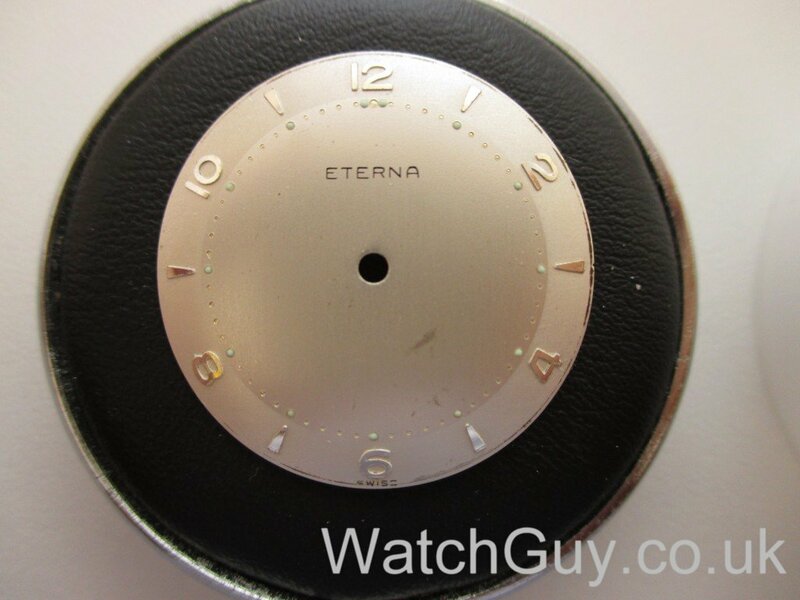 Friend of mine bought a watch that required servicing, when he got it back, he noticed very faint small dent on the dial, and isn’t sure if it was there from the beginning of its purchase, or while it was serviced it got this minor dent, and is looking to see if there is any place that can address his issue, The dial appears to be a Prototype of an accutron, so at this time it appears to be a one of it kind, if anyone has any ideas please share it with me so I can forward to to my friend. Christian I was just wondering about that method you relate on restoring a dial, and just thought of something that may be radical , but wonder if you could consider it on a dial as a experiment. Decal Clear Paper to have the dial image printed on the paper, after the Magic of Photoshop to rid the admiralties and placing the clear paper on the dial, as it is done for printing photo’s and putting them on ceramic mugs, just a thought ? We where thinking of it, but the problem is just getting the print in high enough resolution. A Photo Printer such as one of these Epson would in my Opinion Suffice …. 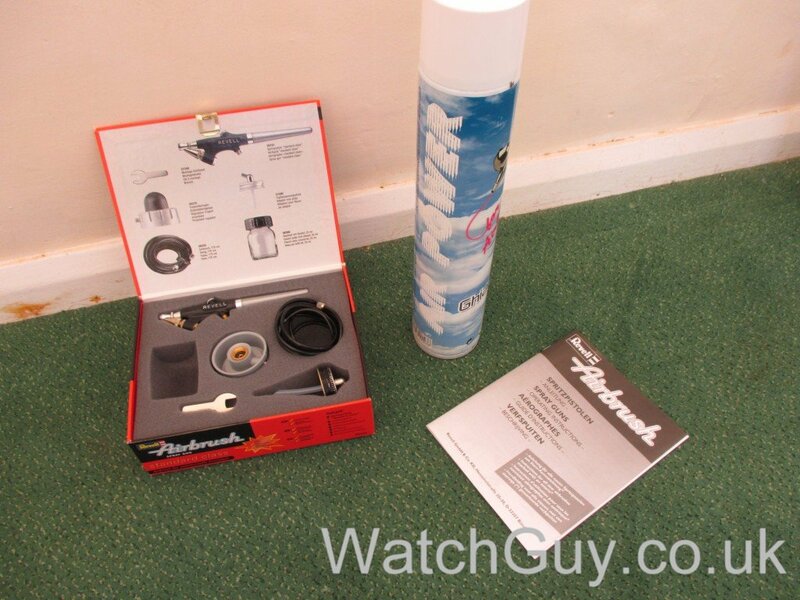 if done properly, you could align the print right over the original markings on the dial, and any missing during the cleaning process would be restored instantly with the photo copy, a coat of Clear UV Spray could be the final option as well…. Interested in the Dial cleaning, wouldn’t mind seeing if you could improve my Gruen airflight. Q: Is there not something that can be placed over the lettering/ logo to stop it being dissolved? Maybe some silicon gel that can be peeled off or something? Model makers must use something similar for when they spray models and want to keep tiny areas unsprayed or keep the paint underneath. 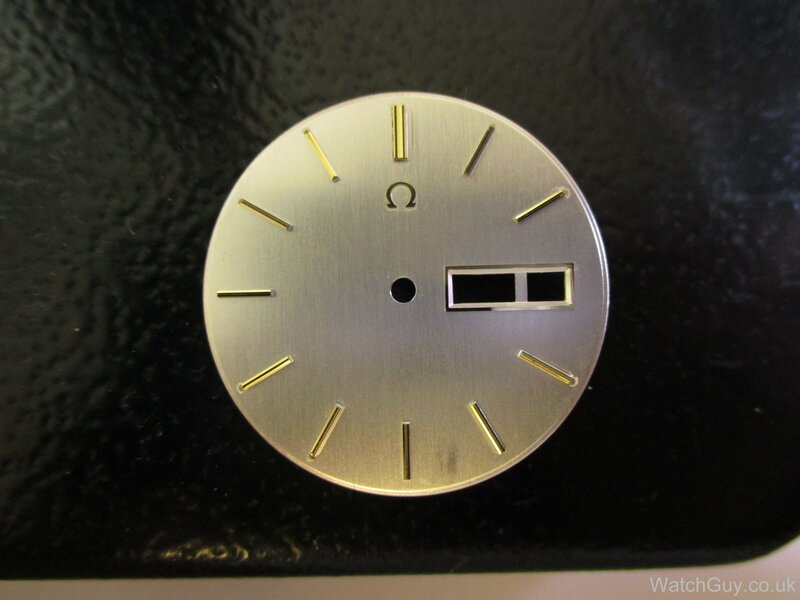 Very interesting post- on the dials, is there a special gold or silver paint to touch up the raised minute indicators? do you varnish first them lume and paint the indicators (if this is the case) after ? We clean off the old varnish apply new varnish and then luminous compound if needed. 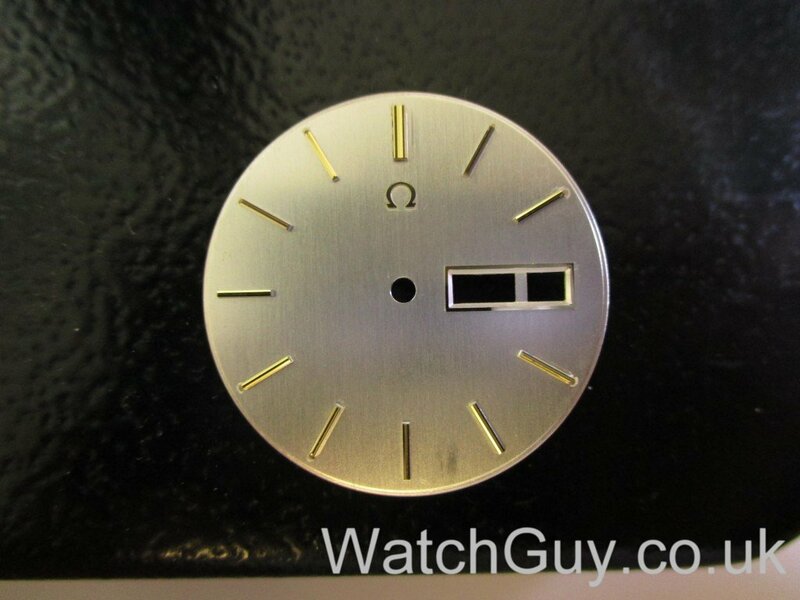 The markers must be restored by a dial restorer as they are not painted but plated or polished stainless steel. Sometimes we can polish the markers up with a cloth. The ones you see in the photos are in such good shape they only needed to be cleaned together with the dial. Hey – great post! Thank you! Please could you advise me how long to soak the dial for? Or is it a case of watch and wait? I am trying to restore a cheap Seiko as a practice run before I try my hand at something of any value! 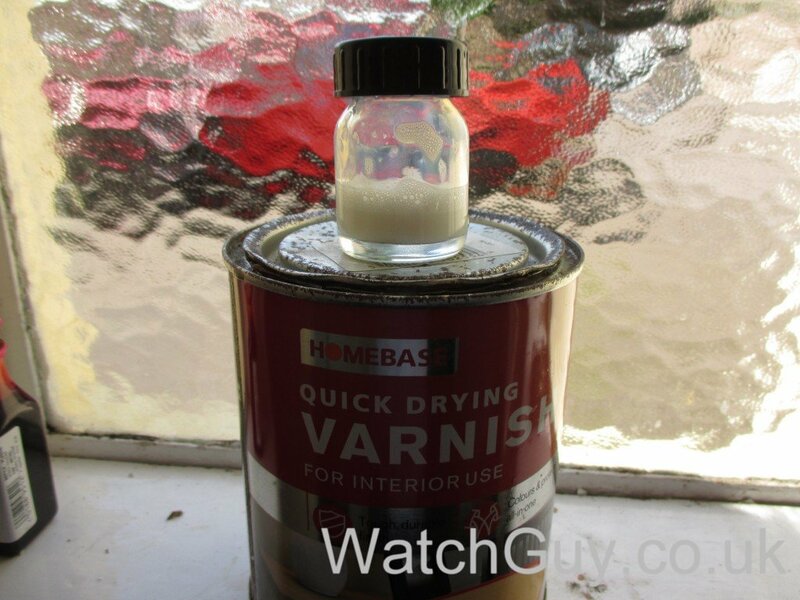 Depends on how easily the old varnish dissolves. Anything from a minute to 20 minutes. I have inherited a 1956 Bulova men’s wristwatch which is in fine running condition, but the (painted on metal) dial has yellowed greatly. I have decided not to refinish the dial. I can’t try the varnish method described here as possible loss of any lettering is unacceptable to me. After researching the issue online, I discovered very many different suggested methods for improving the existing dial, such as diluted ammonia, Windex, silver cleaning solution, Brasso, Rodico, diluted lemon juice, mild detergent, “Rub-off”, and Tarnex. I’m afraid to damage the dial and don’t know which method would be least invasive. Any suggestions? 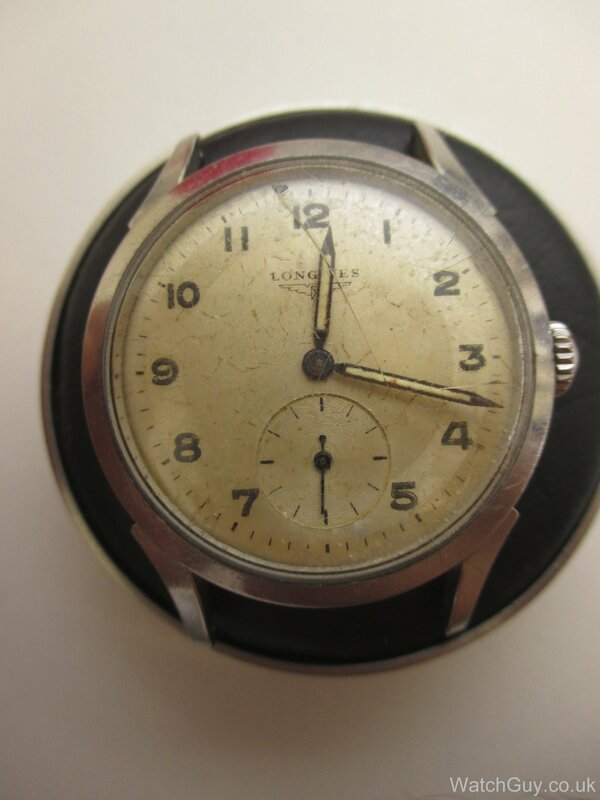 Hello, just carried out your suggestions regarding dial restoration on a eternamatic with a dirty dial and spotting. The dial came up a treat with no loss of printing. I don’t have an airbrush so I used an artists brush and the end result is acceptable. Thank you for the information. John. Did you ever try to put back some text on the dials? Printing, that is. We are trying to find a way to recreate print, but have so far not succeeded. 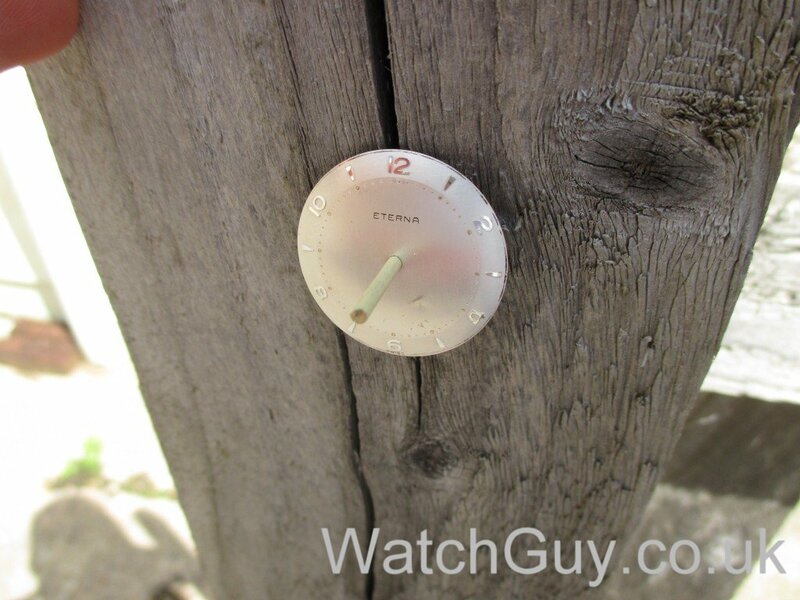 as a fan of both originality and patina, it saddens me to see a few beautifully aged dials given this treatment. i realize that anyone can do with their property what they wish. 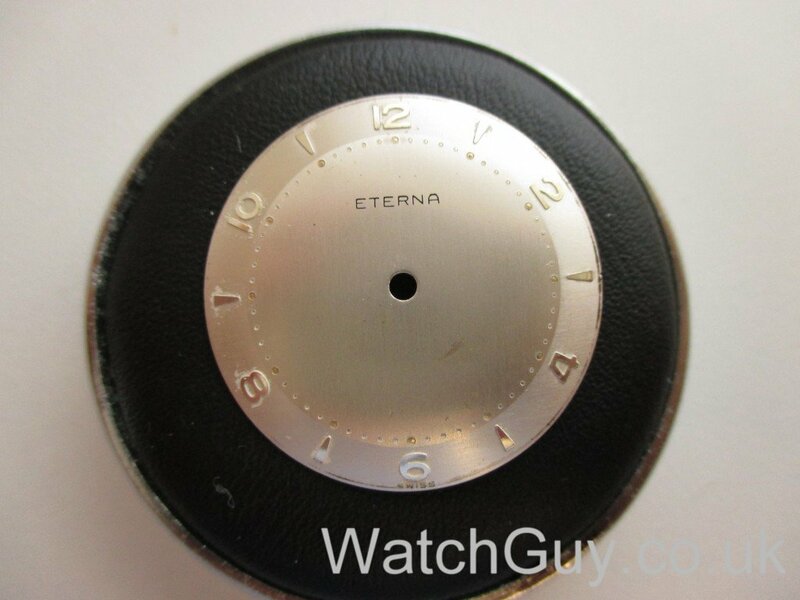 i certainly see the appeal when a dial is in very bad shape. but in the eye of this beholder, a few of those were just lovely and needed nothing but to be perched on my wrist! I agree some patinas should be left as they are, but these dials where ready for a restoration/repaint. My intention is to have something as original as possible without it looking dirty;) And with some new advice from Michael hopefully there will be no damage to lettering or luminous compound! Interesting piece – I’ve been doing similar research and experimentation. 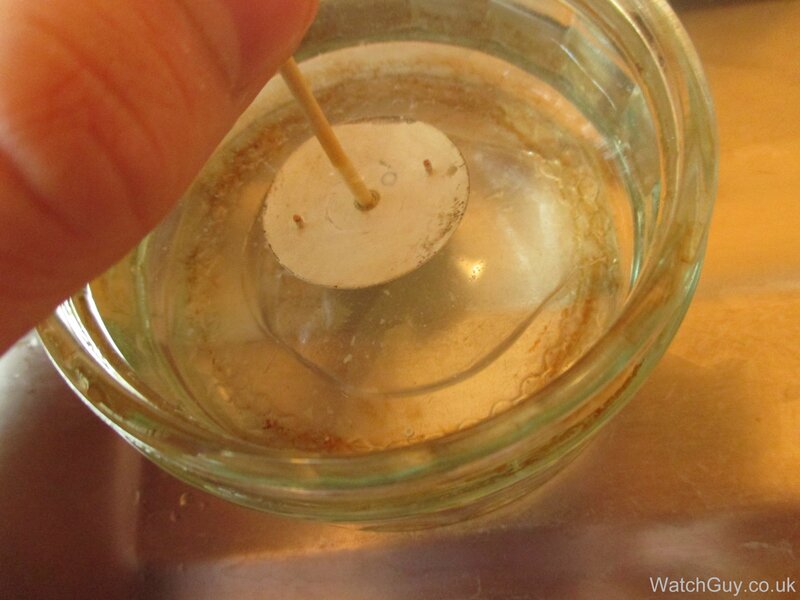 The seems to be two main groups of solvent which people use to take off the aged cellulose varnish: the first is ammonia (available on eBay), diluted and gently brushed on with a sable brush, following by rinsing in distilled water. In the USA, many mention the window cleaner brand “WIndex” but here in the UK, most window cleaners seem to be based on acetic acid (vinegar), and so I’ve used actual ammonia. If you try this, USE A RESPIRATOR! The second method is dipping the whole dial in silver cleaning solution (Haggerty, for example). I’ve used both and couldn’t really say that one is vastly better than the other. Silver dip is easier, of course. I have an Eterna dial that I just cleaned (same vintage as Mitka’s) and there was no harm done to the print, or even the old luminous (!!!). The advantage of this is that you can dip the hands, too and they do come up beautifully. 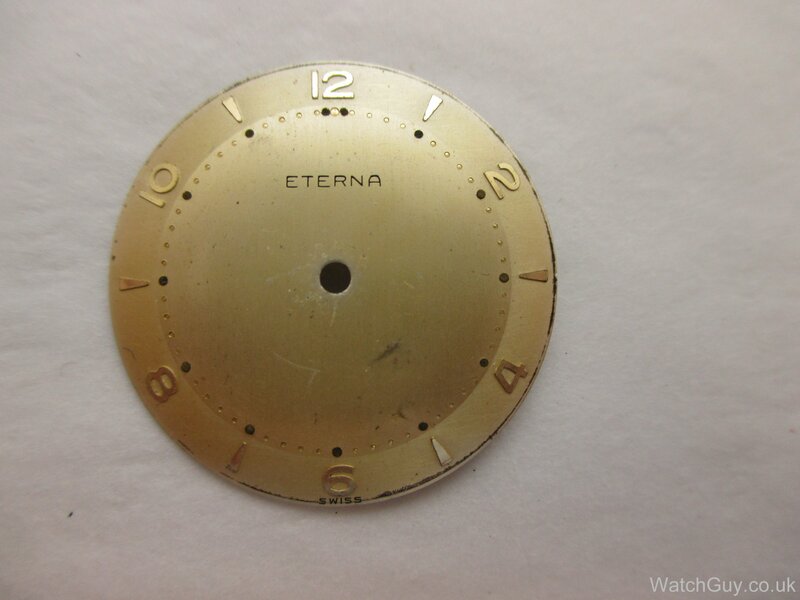 Do you know what the original dial lacquers were; Cellulose or Shellac? 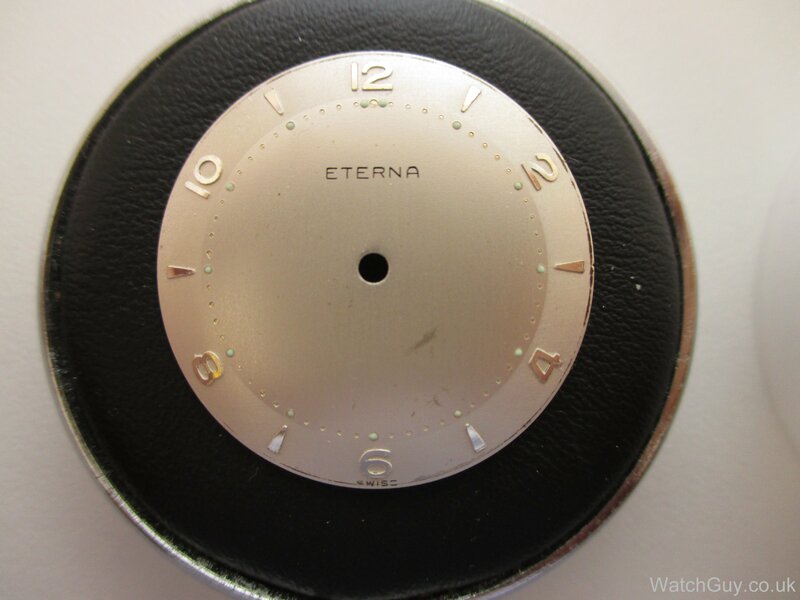 Is the use of water based lacquer appropriate on a metal dial, rather than a solvent based finish, and what do you think the long term adhesion qualities will be? 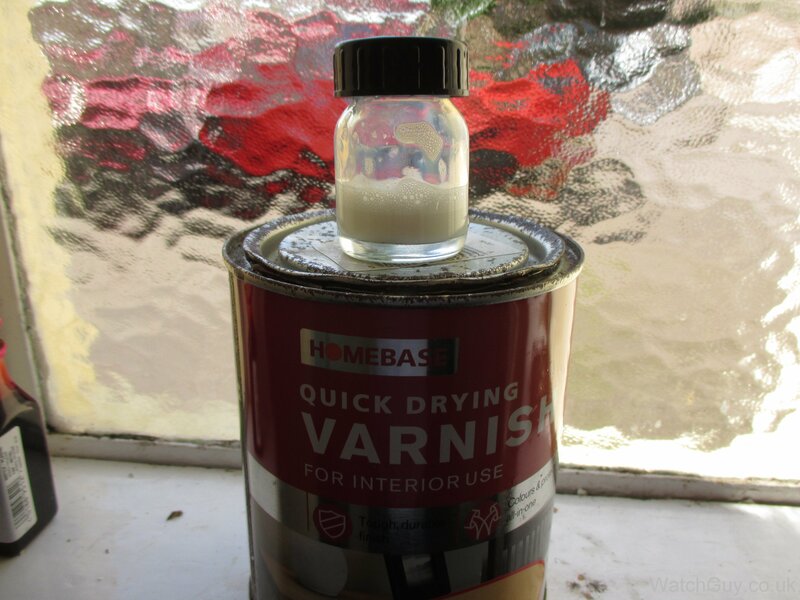 Presume the Homebase varnish you used is acrylic. Hi Mitka excellent piece on this little talked about subject great to see the results. Its always a gamble regarding the text . I have had some good results with dilute lemon juice starting of with a week solution and getting stronger if the stains don’t budge. Your skills are progressing very well, when do you think Christian will let you loose on a customers watch. An excellent post and an underrated subject. 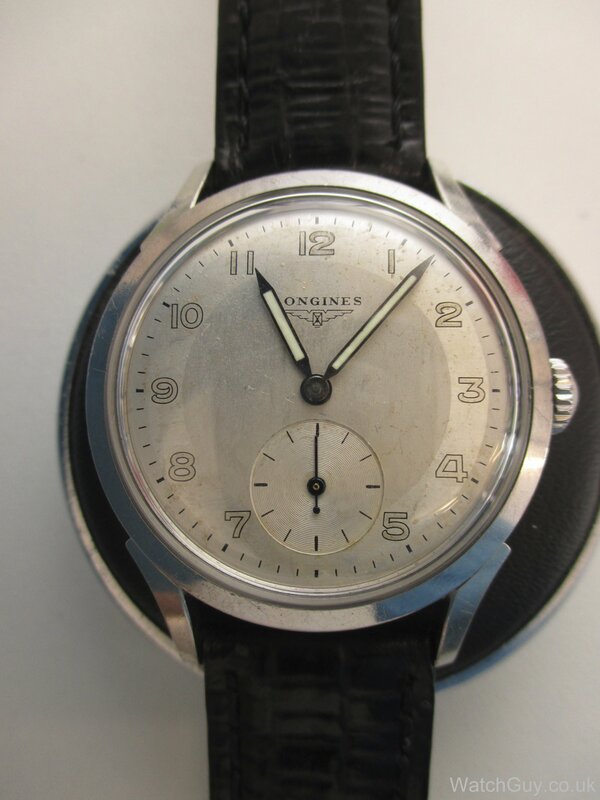 As a very amateur vintage botcher of wristwatches I have found it difficult to understand how on the one hand the quality and longevity of the movement is such that the watch could last forever ,whereas the dial appears to irretrievably rot in a few decades. And all because of a lacquering that is subject to degradation from oil water and air. Un fixable dials are a definite put-off for a great number of potential collectors . 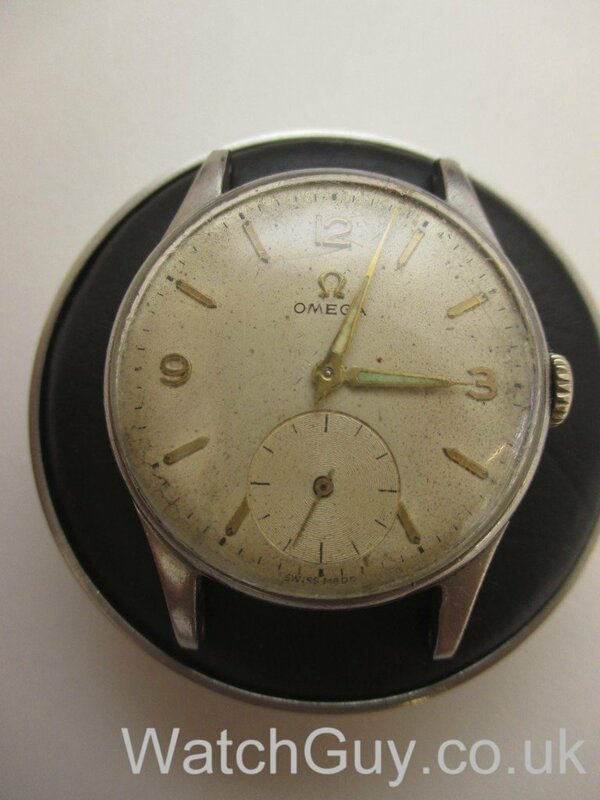 I have a hundred year old omega with an enamel dial and blued hands that looks new whereas my dozen 40 plus year old omegas look unpleasantly old. The subject is open for debate if this is a better way of treating old dials rather than restoring them and in what degree do they remain original. Interesting topic. If this were a Mona Lisa or some other collectable artwork then it would be perfectly acceptable to remove layers of dirt and varnish in order to restore them. Vintage cars are regularly rescued by removing the old paint and being completely resprayed – again acceptable. Why should watches be any different. Ok if you like patina then feel free to keep it but otherwise like an artwork I would often like to see how it was originally meant to look then again other times I like a bit of age. thanks a lot for sharing your method, I’m sure I will give it a try! Cool Jose let me know how it goes! Well done you!!!! A very brave move but it means you can branch out further with your restoration skills. Yes you learn by trying out new things and your mistakes.